How to convert url to emf? If you can understand the meaning of Figure1,you will know how to convert url to emf in a command line with the help of HTML Converter Command Line. 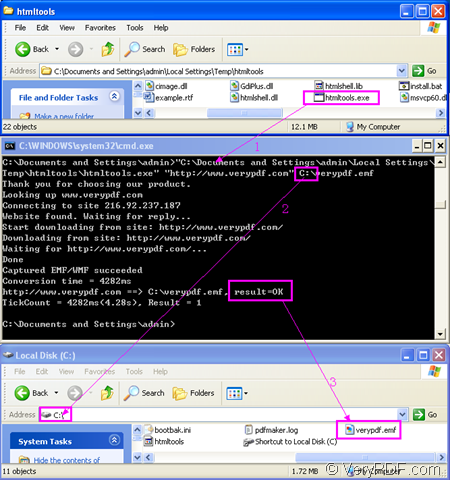 The first dialog box in Figure1 named “htmltools” contains the called program of the conversion of url to emf—htmltools.exe which is the executable file of HTML Converter Command Line.HTML Converter Command Line is a powerful converting software which allows you to create previews or thumbnails of web pages in a number of different formats, such as TIF, TIFF, JPG, JPEG, GIF, PNG, BMP, PCX, TGA, JP2 (JPEG2000), PNM, etc. It also allows you to convert web pages to PDF, PS (postscript), WMF, EMF vector formats. You can download HTML Converter Command Line at http://www.verypdf.com/htmltools/htmltools.zip and install it in your computer. "C:\Documents and Settings\admin\Local Settings\Temp\htmltools\htmltools.exe" is the path of htmltools.exe.You can drag the file into cmd.exe dialog box.Please see arrow1. 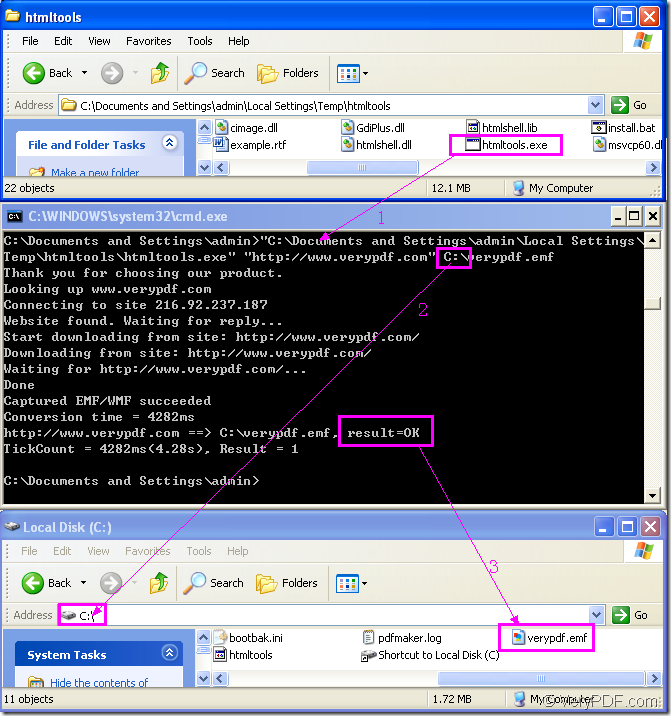 "http://www.verypdf.com" is the URL of webpage.You can input it or copy it into cmd.exe dialog box. C:\verypdf.emf is the directory and name of target file.Please pay attention to the directory,you will find the target file in the specified path you have set.Please see arrow2.If you don’t specify the path for target file,it will be saved in current directory. After clicking “Enter” button on your keyboard,which means run the conversion of url to emf,you will see “result=OK” in a few seconds.Then you can find your target file in the third dialog box,please see arrow3. You can browse the file by some kind of viewer such as IrfanView,GSview and so on. How to print MS Office Excel to tif using Document Converter? How do I extract image file from PDF to jpg? How to convert rtf to pcx?